Just as the magnificent icons that cover every wall on the inside of our St. Innocent Temple comprises a vital element of the distinctiveness of our parish and expresses the beauty of the Kingdom of God made visible on earth, so the splendid gardens created by Fr. Roman, with the dedicated assistance of Matushka Rose Marie, likewise expresses the divine beauty on the exterior grounds of the church property. Beginning around 2002, Fr. 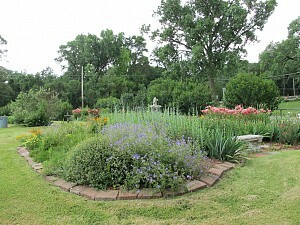 Roman has been gradually transforming plain grass into beautiful flower gardens, that keep improving every year.